Nigerian Biography: About Nigerian Senate. 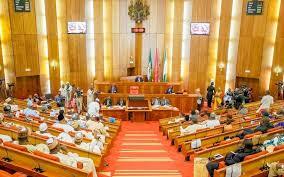 The Nigerian Senate is one of the Chambers in Nigeria’s bicameral legislative house called, the National Assembly. The National Assembly or simply referred to by the acronym (NASS) is the Nigeria’s highest legislature, with power to make laws, which power is summarized in chapter one, section four of the Constitution of the Federal Republic of Nigeria, 1999. "There shall be a National Assembly (NASS) for the federation which shall consist of two chambers: the Senate and the House of Representatives". The Nigerian Senate is headed by the President of the Senate, who is assisted by the Deputy President of the Senate. These Presiding officers serve as political heads. There are one hundred and nine (109) members in the Senate corresponding to the 109 senatorial districts in Nigeria. Senatorial Districts are evenly distributed among the thirty six states that make-up Nigeria. Each state has three senatorial districts while the Federal Capital Territory (FCT), Abuja has just one senatorial district.